Members of the signal transducer and activator of transcription (STAT) protein family are intracellular transcription factors that mediate many aspects of cellular immunity, proliferation, apoptosis and differentiation. 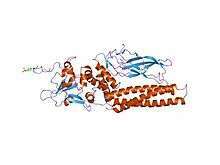 They are primarily activated by membrane receptor-associated Janus kinases (JAK). Dysregulation of this pathway is frequently observed in primary tumors and leads to increased angiogenesis, enhanced survival of tumors and immunosuppression. Gene knockout studies have provided evidence that STAT proteins are involved in the development and function of the immune system and play a role in maintaining immune tolerance and tumor surveillance. All seven STAT proteins share a common structural motif consisting of an N-terminal domain followed by a coiled-coil, DNA-binding, linker, Src homology 2 (SH2), and a C-terminal transactivation domain. Much research has focused on elucidating the roles each of these domains play in regulating different STAT isoforms. Both the N-terminal and SH2 domains mediate homo or heterodimer formation, while the coiled-coil domain functions partially as a nuclear localization signal (NLS). Transcriptional activity and DNA association are determined by the transactivation and DNA-binding domains, respectively. Extracellular binding of cytokines or growth factors induce activation of receptor-associated Janus kinases, which phosphorylate a specific tyrosine residue within the STAT protein promoting dimerization via their SH2 domains. The phosphorylated dimer is then actively transported to the nucleus via an importin α/β ternary complex. Originally, STAT proteins were described as latent cytoplasmic transcription factors as phosphorylation was thought to be required for nuclear retention. However, unphosphorylated STAT proteins also shuttle between the cytosol and nucleus, and play a role in gene expression. Once STAT reaches the nucleus, it binds to a consensus DNA-recognition motif called gamma-activated sites (GAS) in the promoter region of cytokine-inducible genes and activates transcription. The STAT protein can be dephosphorylated by nuclear phosphatases, which leads to inactivation of STAT and subsequent transport out of the nucleus by a exportin-RanGTP complex. ↑ Vinkemeier U, Moarefi I, Darnell JE, Kuriyan J (February 1998). "Structure of the amino-terminal protein interaction domain of STAT-4". Science. 279 (5353): 1048–52. doi:10.1126/science.279.5353.1048. PMID 9461439.